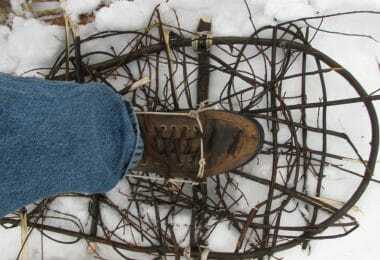 You have to agree that before setting off on a wilderness adventure, it’s crucial to be as prepared as possible. However, with limited space and capacity available, it’s important that every item packed is both functional and compact, right? This is where the best paracord bracelets will come in handy. A paracord bracelet is exactly what your survival arsenal needs. The material is typically a lightweight nylon kern mantle rope, which is the same material used for suspension lines for U.S. parachutes, and it has an extremely wide use for practically every emergency situation. 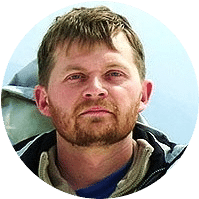 If you’re new to the outdoor niche, or simply unfamiliar with these survival gadgets, choosing the right bracelet for you can be quite frustrating. That’s where we come in and help you out. 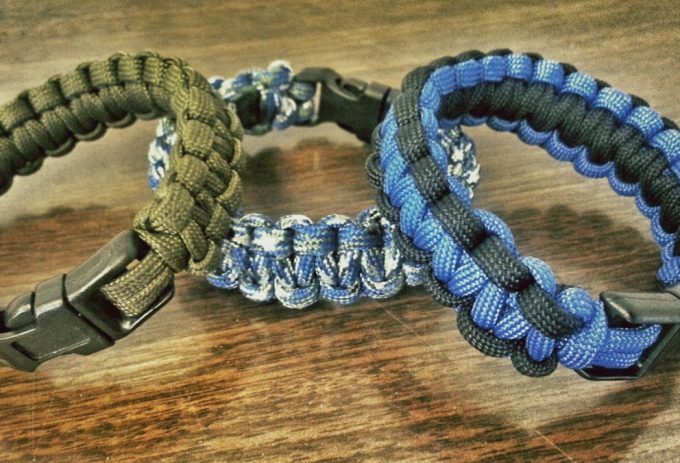 In this article, we will discuss real-world applications of paracord bracelets, features to consider before buying, and, of course, review the top six bracelet models on the market. By the end of the read, you will make an informed decision and end up exactly with the bracelet model you were looking for. Before selecting your new paracord bracelet, there are a few things to keep in mind. With so many added features and accessories, it can be hard to know which bracelet is the right choice. Reference these purchasing guidelines before making your final selection. The material used for your paracord bracelet is what will determine whether it is a premium product or a cheaper knockoff. The majority of the premium survival bracelets are manufactured with strong parachute cords with breaking strengths of up to 550 lbs. It is pretty much the top most quality cord you can find in the market and is a safe one to use as well. There are a few bracelets that use type II or 400 lbs paracord material. These bracelets are still useful, but lower quality than the traditional 550 cord bracelets. Ensure to see if the paracord material are actually type I or type II before you buy it. This is a very important factor to consider before you make your final pick. Most cords can disassemble to at least 10 feet, however you can even find a few top brands offering paracord bracelets that open up to even 20 feet in length on complete disassembly. Generally speaking, when it comes down to it, the longer the better. The longer your bracelet is, the more material you will have to work with, should a survival situation arise. 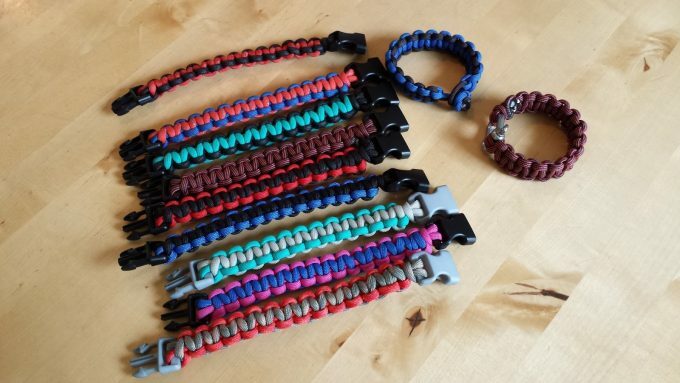 Many paracord bracelets are now being manufactured with added tools and accessories. These help aid in survival applications and can increase the versatility of the product. Most companies will incorporate the additions into the bracelet itself, so it doesn’t take up any additional room. 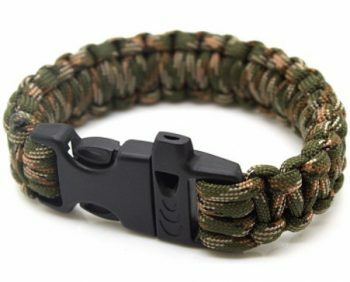 Some of the more popular tools included with paracord bracelets are compass, knife slide, whistle, and magnesium fire starter rod. Go with the bracelet that offers the majority of these tools in the package. Of course, one of the most important things to consider is what you will be using this bracelet for. Some paracord bracelets are best used for camping and hiking, while others are great for fishing, boating, and hunting as well. Think about what kind of practical applications you could most use your new paracord bracelet for. Мost paracord bracelets are relatively versatile, but some contain added accessories to make your life easier. For example, bracelets that include a compass will be better suited for trekking and mountaineering, versus a bracelet that has no additional tools. When in doubt, choose the bracelet that offers the most versatility for real-world survival situations. Like most purchases, your budget will also be a determining factor in your final paracord bracelet selection. It’s important to remain within your budget parameters, but also not to compromise on quality and efficiency. You will have to compare and contrast several products with your budget to determine which one will meet your needs the best. In good news, paracord bracelets are a relatively inexpensive accessory in the scheme of outdoor equipment. 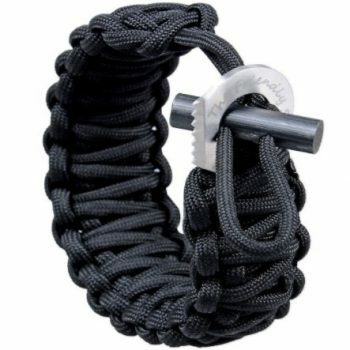 Compiled below are six of the best paracord survival bracelets on today’s market. Use this guide to compare specs and features to determine which bracelet is best for you. Description: The SharpSurvival WRAPS Paracord Bracelet is an all-inclusive, stylish, and budget friendly bracelet. Whether it’s used for hiking, hunting, or mountaineering, this bracelet is perfect for all potential survival scenarios. This heavy-duty bracelet includes three additional accessories: a magnesium fire starter rod, a compass, and a sharp eye knife. All accessories are compact and weather-resistant. 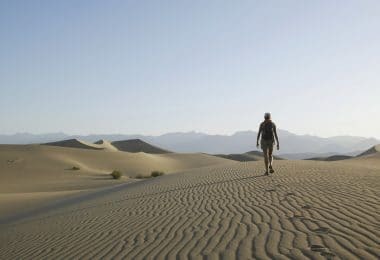 This includes both extremely hot and cold temperatures as well as wind. These added tools make this bracelet incredibly versatile and useful for numerous survival scenarios. The sharp eye knife is also made of stainless steel. This means it is resistant to rust and corrosion. Be sure to remain mindful while you are wearing this bracelet, as the knife has limited protective covering. The compass has been rigorously tested and works flawlessly. Together, these tools work with the paracord bracelet to provide an all-inclusive and versatile final product. This bracelet is sure to meet all of your survival needs. Related: In addition to your new paracord bracelet, consider purchasing the Survival Shack Emergency Survival Shelter. 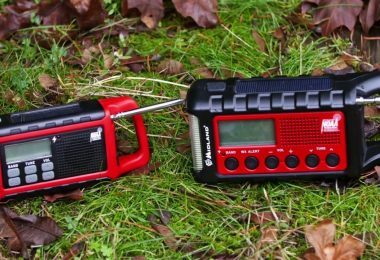 It is suitable for two people and is super compact, making it easy to incorporate into your survival arsenal. The shelter is completely weatherproof and will truly make you better prepared for any situations that arise. Description: The SAS Survival Paracord Bracelet is an incredibly high-quality and durable bracelet that is sure to meet all of your survival needs. In order to make it worth its name and to stand up to its promise for quality, the SAS paracord bracelet uses a 550 lbs parachute cord that is not only hard, super strong and durable but the material is also rot proof in nature as well. The stitching of the material will most definitely grab your attention as it is “cobra stitched” for more strength. An SAS paracord bracelet will fit wrist sizes between 7 inches and 8 inches. 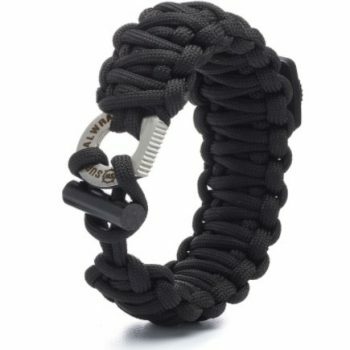 The total length of the paracord bracelet is 10 feet. Another coveted feature of the SAS Survival bracelet, is its included whistle. The whistle is built into the 15 millimeter quick-release buckle, so it’s easily accessible at any given moment. 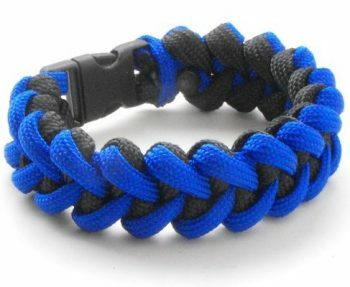 Should a survival situation arise, this bracelet can be quickly and easily unraveled. Whether you are an avid outdoorsman or simply looking to expand your survival arsenal, this is the product for you. Related: Another crucial component of your survival kit is a trusted water filter. The LifeStraw Personal Water Filter is compact and can filter up to 1000 liters of water before needing a replacement. Plus, it does not require any batteries or additional equipment. Description: The Friendly Swede Premium Paracord Bracelet is perfect for anyone who wants both a stylish and useful paracord bracelet. This bracelet is not only for survival situations, but for everyday wear as well. Plus, the bracelet can be completely disassembled in just three minutes. For survival scenarios, time is of the essence. So, this feature is incredibly important. The fire starter and sharp eye knife/scraper are great accessories to make the bracelet even more versatile. The knife is incredibly sharp, so be aware when taking the bracelet on and off. Having both a fire starter and knife is essential for camping, hiking, and other scenarios where you may have limited access to other options. The 550 lbs cord is made of polyester. This helps the bracelet to be better resistant to the elements, primarily moisture. In addition, this bracelet comes with a lifetime warranty, so it’s completely risk-free. 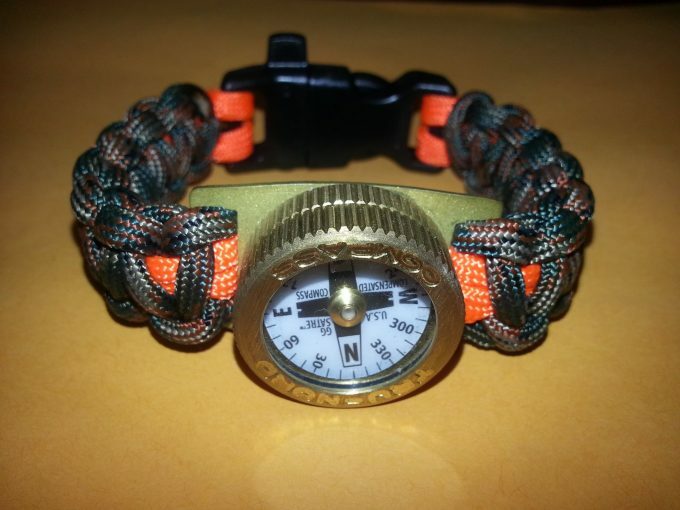 Related: Since a compass is not one of the extras on this bracelet, you might consider getting the 10 pack of BoredParacord Adjustable Compass Shackle. It will not only offer you an easier and more secure way of tying up the bracelet, but it will also add the useful compass on your list of extras. Description: Containing 2 professional grade and genuine paracord bracelets in the package, the Duro Gear Survival Paracord Bracelet is a terrific thing to keep while you go fishing, camping, mountaineering or hiking. Even though the price is slightly higher with these bracelets, the versatility is unmatched. Plus, you get two bracelets in two different colors: army green and tactical black. With the added accessories, no survival situation will be too much for this bracelet to handle. 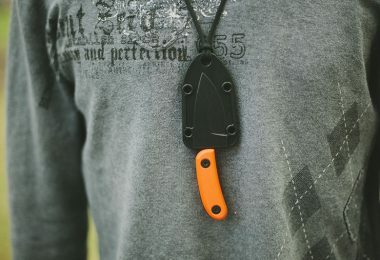 You can start a fire anywhere with the fire starter, use the whistle to alert your location and/or danger, and use the knife for any other needs. In addition, while the bracelet unravels to 13 feet of paracord, there are seven strands incorporated. This means there is over 90 feet of total cordage. This bracelet is truly all-encompassing and perfect for every outdoor and survival application. 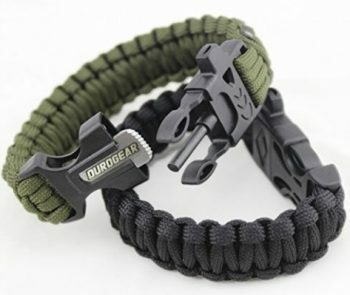 Related: In addition to the paracord bracelet, consider adding the DuroGear Paracord Grenade Emergency Kit as well. This compact kit will provide you with an additional 196 feet of cordage, making you better prepared for anything thrown your way. Plus, there are several added tools and accessories. Description: The Friendly Swede Trilobite Paracord Bracelet is similar to The Friendly Swede Premium Paracord Bracelet, but is built to be a little more durable and ‘beefy’. This bracelet comes in three separate sizes, making it easy to find the perfect fit for your individual body. There are no added accessories with this bracelet, but there is a bow shackle pin, which allows the bracelet to be perfectly fitted to your wrist. In addition, each package comes with an extra pin, should you lose the original. 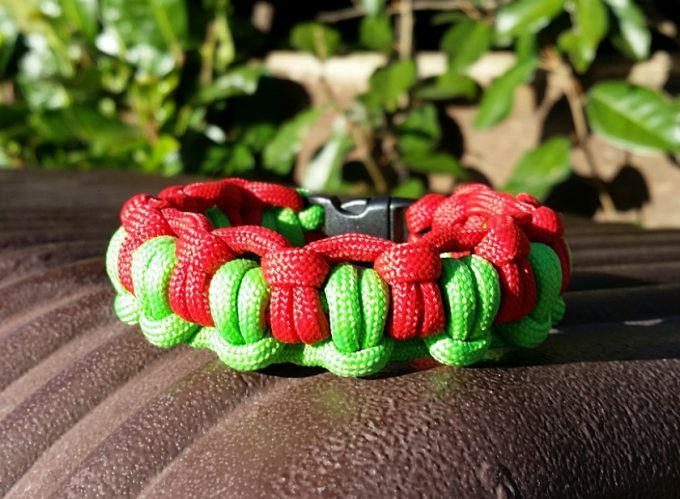 This bracelet is a bit wider than other paracord bracelets, but is also more heavy-duty. The manufacturer states that the bracelet can hold up to at least 350 pounds. While this is slightly lower than most other leading bracelets, it is still a good capacity. The bracelet can be disassembled in just one minute. Quick disassembly is incredibly important, as time is often of the essence in survival situations. Related: Another crucial component of your survival kit is a good first aid kit. This 66 Pieces First Aid Kit is sure to meet all of your needs. The best part is that it is small enough to fit in the palm of your hand. Included in the kit, are various supplies including bandages, a small scissors, safety pins, antiseptic wipes, tweezers, and more. Description: The Para-Cord-Belts Piranha Bracelet is perfect for any outdoor-enthusiastic child. The breakaway plastic buckle adds an extra security layer, which is always appreciated when it comes to children’s products. 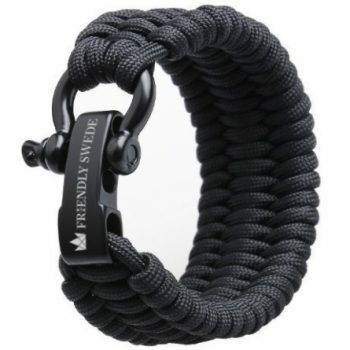 In addition, the bracelet is just as strong as a typical paracord bracelet, as it can hold up to 550 lbs. With two internal strands, the bracelet is extra durable. For any child in your life who wants or needs an added security protection when they are outdoors, this is the perfect product. In addition, this bracelet comes in four distinct sizes. This makes it incredibly easy to find the bracelet that will best fit your child. In addition, since this bracelet is so affordable, it gives you an option to purchase multiple sizes so that the child may grow into each bracelet. With 16 colors to choose from, this bracelet is perfect for every child in your life who is passionate about the outdoors. 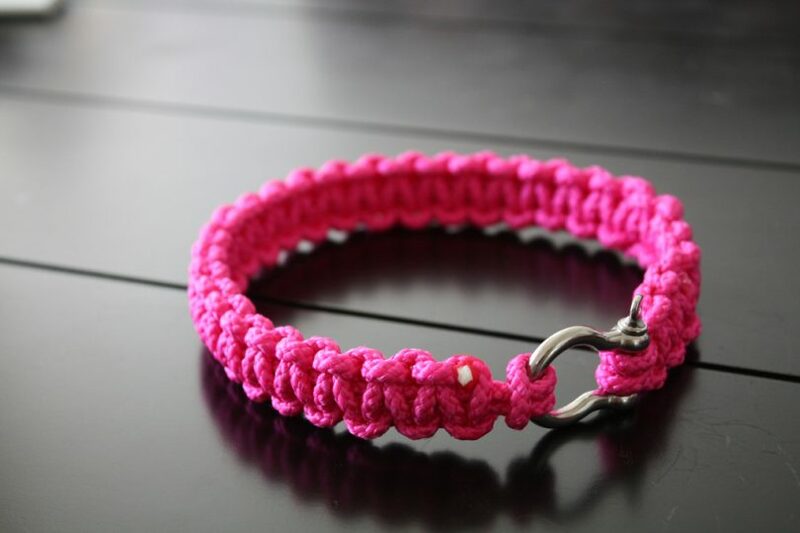 Related: In addition to a paracord bracelet for the children in your life, consider purchasing one for your dog as well. The Paracord Planet Dog Collar DIY Kit has all the necessary tools to create a paracord dog collar. If you regularly travel with your dog, this is the perfect addition to your survival kit. We have reached the end of our article. We covered five features to look for when purchasing a paracord bracelet: cord type, cord length, additional tools/accessories, best uses, and price. By using these determining factors, you can better choose a paracord bracelet that will suit your needs. We also looked at six of the best paracord bracelets on today’s market. Each bracelet has different features and uses, allowing you to choose the best bracelet for you. Some bracelets are longer, some shorter. Some have additional accessories, some only feature the cord. Some bracelets are best suited for camping and hiking, others for trekking, mountaineering, and fishing. If you have any additional questions or comments, please feel free to reach out and comment below. If you enjoyed this article, please share on your social media pages. Thanks for reading.